Our baby is one month old! Recently my life has been changing diapers, nursing, and napping. It’s a good thing that I stocked my freezer with meals and all the bread I made last December, because we’ve gone through just about all of it. I don’t mind emptying my freezer or taking care of Amelia at all, but it does mean that I haven’t had two hands available to do cooking or typing/blogging. As baby gets bigger, spending time in the kitchen or on the computer should become a little easier, and I can keep updating this blog! I was super excited to finally do some baking. And I loved this Black Bottom Oatmeal Pie. The only thing I made before last Saturday was baked oatmeal. It was very quick and easy to make in the evenings, and I only made it to streamline my breakfast during the week. My friend Jen reminded me that last Saturday was Pi Day. Was I going to make a special pie for a super-special Pi Day, since it was actually 3/14/15, the extended digits of Pi? It was a shame not to make a pie, since Alex would be home all day and able to watch baby. I hadn’t planned to make anything elaborate, but then I saw that Smitten Kitchen had posted the recipe for a Black Bottom Oatmeal Pie, and although it was more complicated than the super-easy Key Lime Pie I made recently, I couldn’t resist it. This pie wasn’t too difficult overall, but it was a little more involved than I probably should have tackled with a 4-week old at home. When you have the time to make it, though, it’s totally worth it. As you can see, it didn’t last long in this house. 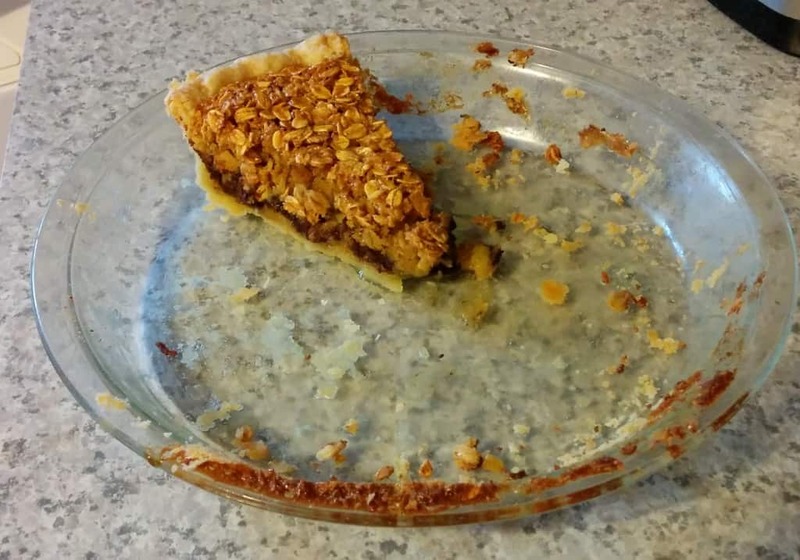 The oatmeal layer was a little like a pecan pie; the top of it was nicely chewy, but there was a tiny bit of goo underneath. I loved the combination of chocolate and chewy oatmeal. I liked the spiciness of the nutmeg I used in place of the ginger that I didn’t have. The pie crust was flaky and flavorful from the butter. Overall this pie wasn’t too hard to make, and it’s impressive since it’s layered. I think I would make this again sometime. If you love the combination of chocolate and oats like I do, check out these chocolate oat squares, this recipe for chocolate peanut butter bites, and these chewy oatmeal cookies with chocolate chips. This delicious black bottom oatmeal pie combines toasty oats in a pecan pie-like filling on top of a rich layer of chocolate ganache. Combine flour, sugar, and salt in food processor. Add butter and pulse until the butter is in little pieces, no larger than peas. (You can also cut in butter with a pastry cutter, but since cold butter is hard, the food processor is much easier.) Drizzle in water and pulse until clumps form. Pour into a bowl and use your hands to knead the dough together into a ball. Flatten into a disc and wrap in plastic wrap. Refrigerate one hour. Remove dough from fridge. Roll out into a 12 inch circle and turn out into regular pie dish or pan. Drape into the pan without stretching the dough. You want about an inch of dough to overhang the sides of the pie pan. Trim if necessary to make it an even circle. Fold excess dough under the edge of the pie crust and crimp to seal. (This is important as it gives you height you need for the pie filling.) If you choose to parbake the crust, chill the crust briefly to keep the butter from melting too quickly and the crust from becoming misshapen (like it did in my pie crust). Prick bottom of crust and bake at 400F for about 10 minutes. Let cool. Meanwhile, place cream and chocolate in a microwave-safe bowl. Microwave in 15 second increments on high, stirring after each increment. Repeat until the ganache is smooth. Do not overheat or your ganache will become grainy. (Mine did this; I added extra cream to compensate, although it didn't really help smooth it. However, you couldn't notice the graininess in the final pie.) Spread evenly over bottom of cooled pie crust. Place in freezer while you prepare the oat filling. Reduce oven temperature to 325F. In a large bowl, whisk together brown sugar, nutmeg, salt, and melted butter. Add corn syrup, vanilla, and vinegar. Add eggs, and whisk again to combine. Stir in the oats. Place prepared, chocolate-covered crust on a baking sheet, and pour filling into it. Bake at 325F for 55-75 minutes; mine took about 65 the first time and 75 the second time. Pie will look dry on top. If the filling sloshes underneath the surface when you pull it out, the pie is not done and needs more time. The center will be slightly firm but have a little give when done. Cool completely (2-3 hours) before serving.